It’s nothing but outlaws and gunslingers at High Noon Casino. Bring out you inner cowboy and head on down to this frontier town to play casino games like Table and Card Games, Slots, Video Poker, Scratch Cards, Progressive Jackpots. Don’t miss out on the $60 No Deposit Bonus to play Slots, Scratch Cards, and Keno. 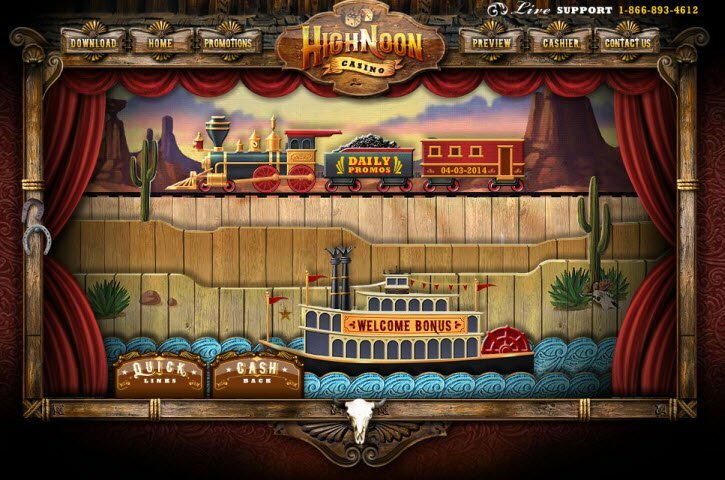 If you haven’t checked out High Noon Casino by now, well it’s high time you did. The design alone makes this gambling site worth a spin. Its elaborate interface recreates a frontier town in high quality animation. Aside from the impressive graphics, High Noon Casino hosts generous Bonuses starting with multiple Welcome Bonus packages. Each day High Noon Casino updates its site with a new Daily Promotion to keep the rewards coming. Country folk might have a reputation as rednecks and simpletons, but it doesn’t git any slicker than High Noon Casino software. This gambling site pulls out all the stops starting with its casino interface. You ain’t seen one like this before! The designers created the complete Wild West experience. The homepage looks like a town right out of the American frontier. Explore the casino and you’ll come across insanely great graphics. Don’t miss the promotions section with a train and steamboat chugging by where you shoot and click to enter different pages. Occasionally, I experienced some crashes, but you have to give the designers credit for coming up with such a well crafted casino. High Noon Casino doesn’t mess around when it comes to games either. Gamblers can choose from a selection of High Noon Casino games like Table Games, Card Games, Slots, Video Poker, Scratch Cards, Progressives and Mobile Casino powered by Real Time Gaming. On the down side, the casino doesn’t offer a large number of Video Slots nor does it support Live Casino Games. You ain’t seen one like this before! The designers created the complete Wild West experience. The homepage looks like a town right out of the American frontier. Here’s a casino that gives a handsome reward just for signing up. High Noon Casino offers an outstanding 200% Welcome Bonus up to $200 on Slots, Scratch Cards, and Keno. Alternatively, those who prefer Card Games like Blackjack or Video Poker can choose the 100% Bonus up to $500. On top of that, players can sign up for the High Noon No Deposit Bonus gives new players a $60 Free Chip to play Slots, Scratch Cards, and Keno. Many gambling sites lure in new players with extravagant Sign Up Bonuses, and then leave their players in the dust, with not a Bonus to be found. The High Noon Casino Bonuses don’t end after sign up. The site offers Daily Promotions to reward its loyal visitors with Deposit Bonuses. The Wild West may be known for its bank robbers, but you won’t have to worry about that at High Noon Casino. When it comes to making deposits for real money play, High Noon Casino accepts a handful of reputable banking services. Transfers process instantly with a minimum deposit of $20. High Noon Casino accepts even more payment options for cashing out winnings. Options include bank transfers, wire transfers, credit card, and courier cheques from a range of well-known companies. High Noon Casino even includes 5 different banking options that allow players to cash out their payments instantly with a maximum of $5,001. 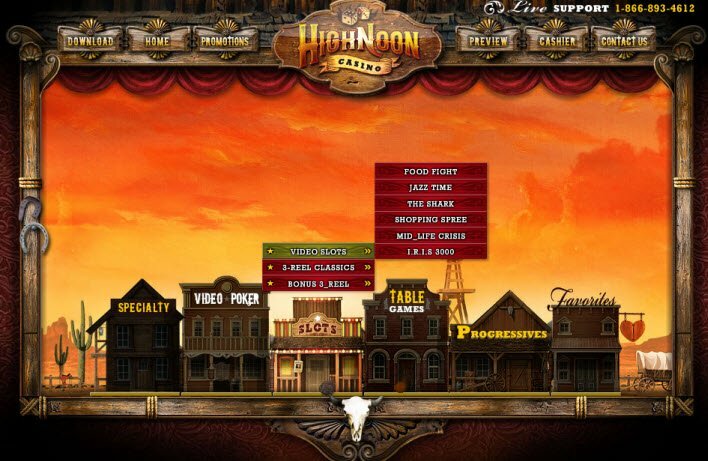 Should you have any issues while playing, High Noon Casino staff members are standing by to help. You can contact the casino via Live Chat support, Telephone, Fax, email, and snail mail. A heads up to my fellow Americans - the casino offers toll-free telephone and fax support to players in the United States. How many deposits do you have to make for the welcome bonus? They actually offer quite a few welcome packages at the moment. Currently, none require multiple deposits. Brands will change their offers from time to time. Simple check the terms and conditions. Also, keep an eye on the wagering requirements (the amount of bets required to make before cashing out winnings).